*biologist pushes glasses up nose while pointing laser pointer at slide* "The resulting abomination is why I argue that magic is no substitute for science when it comes to genetics." -How does this compare to other Remodelers? -What are Transmogrify's best uses? -Is this card too slow? Transmogrify is a really fun card, but I think it needs to be thought of differently than most other remodellers. First of all, it can't get rid of coppers and curses (barring edge cases). I think it's the only remodeller that can't do that. Second, I think it's much more effective at making your turn better than making your deck better. It can really help you get and keep your pace by putting the cards you want in your starting hand, and I feel like that's its main appeal. It's not a straight up trasher, but a value trasher, meaning you can increasingly improve your deck each time you trash. You want to use this to upgrade existing cards (like Mine), not trash cards entirely. The fact that you have to play it twice is offset by remodeling in-hand and having more choices to remodel. Transmogrify is my favorite reserve card. It has so much potential. First of all, it can't get rid of coppers and curses (barring edge cases). Wait, what? I was under the impression you could trash 0 costing cards with it, just get nothing in your hand. It's the only card that says "up to 1 more" so it's kind of confusing, but yeah, if you trash a copper or curse with it, you just get another copper/curse in your hand (again, Poor House, Bridge Troll etc can change this). Even if you could trash Coppers en Curses, that seems like a pretty bad use for it. You can turns Curses into Coppers, which isn't the most exciting use of Transmogrify, but is certainly sometimes the right move. Just realized I didn't finish the title. Fixed. I've done this with Butcher many times. This would seem to be just as good for it, and cheaper. By far, the best option with Transmogrify is to flip estates, silvers or other cards into a village or draw so you can kick off mid-game engine turns with lower component densities. A hand of Silver, two coppers, Tr, and Smithy is vastly worse than TrTrCCSmithy. As far as speed at the opening. Meh, it is not blindingly fast like Remake, but it is a pretty nice way to up your cash density. It is a turn slower than Jack, and you have high odds of $3 or lower hands ... but you have a lot of mid-game flexibility. It is an absolute beast with on-trash effects in the early game as you can both improve buying power and trigger your on trash effect (e.g. E -> S, discard Market square, gain a gold). Fortress works very nicely if you have $5 draw and even Squire can work nicely if only to replace the dead Squire. Being able to wait until the best time in a shuffle to trash is very nice if you are doing something complicated. Transmogrify is also very nice on a lot of potion boards, you lower the odds of bad potion hands and also have the option of making the Pot into an immediately playable $5. The down side of Transmogrify is that you must trash at the start of the turn. If you are building an engine or just have plenty of draw, that makes it ever less likely that you will hit the last estate or that you will find that Province to make into a Plat. This also makes it far weaker at cannibalizing your deck near game end, you have to be awfully sure of yourself to junk a Smithy into a Duchy if you still need to draw a province buying hand to win the game. Having multiple Transmogrifies lined up is also nice for retooling your deck. E.g. you go Festival/Library and your opponent then goes Council room/Festival, if can be handy to be able to swap Libs for Huntinggrounds or Altars. This can be exceedingly nice when your opponent has committed to a deck that has a particular weakness (e.g. Possession against Madmen decks, discard attacks against a lot of Golden decks, Swindler against Hparty decks). In general, though, I have not seen too much call for multiple Transmogrifies outside of a handful of power combos (e.g. Transmog/Fort/Catacombs, Transmog/Scout/Rabble). Transmogrify is an okayish trasher for Estates and Curses, but has a lot more potential than that. You can trash your Cultist to draw 3 cards and replace the Cultist. Trashing Rats for an extra card is pretty nice too. You can easily threaten a 3-pile, if you have several sitting on your mat. Hunting Grounds looks particular nice with this. Or if you have a bad draw you can exchange one of your cards for one that helps your engine go off. This is a card that makes any engine more reliable. Butcher gives you two coin tokens, whereas Transmogrify gives you $1 to spend this turn (I know there are edge cases). I think that more than makes up for the price difference. Either way you're probably not getting Butcher or Transmogrify just to turn Curses into Coppers so I don't think it's really relevant to anything, but I do think Butcher is significantly better than Transmogrify for that use. Transmogrify is very good in some aspects, but very bad in others. Pros: You can trash from your hand and directly gain into your hand. Cons: Only at the start of your turn. Oh, and you have to play this a turn in advance to make it worth it. Transmogrify gets better with Wharf (most cards do). Transmogrify is awesome with Dark Ages cards. Overall, I don't think it's a great card. It's good to have one or two of these cards handy in an engine, but nothing you should buy en mass. It's a hard card to evaluate, because it really depends on the kingdom, more so than some other cards. Nice late-game combo: Transmogrify/Distant Lands. Very cool idea. Even though the bonus isn't on-play, if there are good silver gainers, transmogrifying a silver into an Island and setting it aside with an Estate might be a good early game move, too. I think Transmogrify is better thought of not as a trasher, but as a card that helps your opening draws each turn. 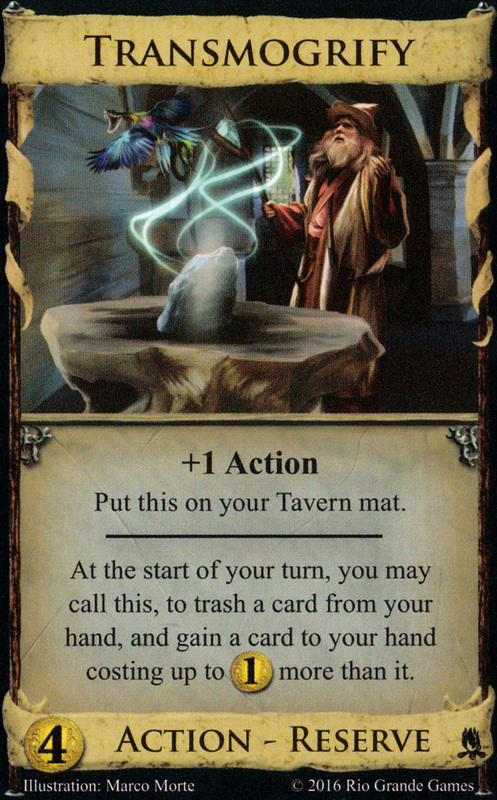 Essentially with this on the mat, if you have terminal collision, you can switch a card out, get a village or upgrade it into something better. Sometimes, you want to upgrade cards, but there are even cases where you want to downgrade. What I am finding out with this card the more I play with it is that it adds more consistency to engines. I'm not saying it's bad, just that you can often do other more useful things. Further expanding upon my terminal collision idea, this might allow you to overbuild with terminals. Let's say you want key terminal $5's. With Transmogrify, you can keep buying that key $5 and when they collide, you can switch them out for a $5 village, assuming one is on the board. So, that's a thought to keep in mind. One nice thing about this card is it IS a Reserve card, so you get to use it on the turns where you have something good to use it on. Or at the very least, before you draw your cards from playing cards that let you draw them. Cards like Remodel require you to be able to get them, and then have at least an Action to play them. That's what I've been doing. Transmogrify itself is a $4 card, so by way events, there will always be something to Transmogrify from. If you have 2 of these in your Tavern with a Silver, you can double Transmogrify the Silver into a Distant Lands. In either case, getting a Distant Lands in this fashion is a guaranteed 4pts since it goes in your hand, and you'll have at least one action to use it. I wouldn't mind using this early on either, as the Distant Lands that gets Reserved stays out of your deck. That's what I've been doing. Transmogrify itself is a $4 card, so by way events, there will always be something to Transmogrify from. If you have 2 of these in hand with a Silver, you can double Transmogrify the Silver into a Distant Lands. If you have two Transmogrifies in hand, you can not use them in the same turn. I meant to say in Tavern. Corrected! I predict that this card is going to have lots of swings in the card rankings. It has so far been extremely difficult for me to judge how good this card is, though I have noticed that it is very hard to play well. Possible candidate for 'most difficult card to play correctly in Dominion' (last time someone asked that question, Procession seems to have won). It's not as hard to use as Procession. It's an incredibly high skill card to use, but I'm doing quite well with it. It's great for milling Provinces when you're ahead, especially when you have 4 of them sitting on your bench. Procession is a lot harder to use. Overall, Transmogrify is an awesome card.